Everyone has had those moments when an accident happens and you’re frozen because you just don’t know what to do. Accidents with your mouth or teeth, or if you’re experiencing pain, can be just as scary. The important thing is to not panic and to contact an emergency dentist as soon as possible. When you contact East Pershing Dental in Cheyenne, you can be confident that you’ll get the best care and attention possible. 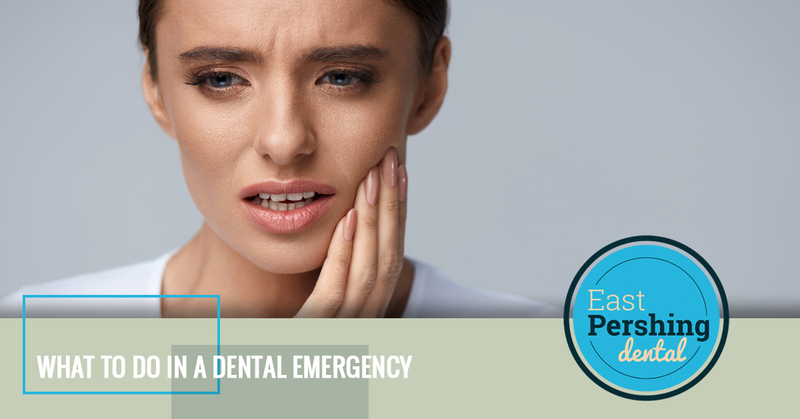 Once you have scheduled an emergency dental appointment, here are some things you can do depending on your situation. A swollen face can be a serious situation, so it’s best to act fast and visit a dentist. If you have an infected tooth, bone infection, or gum infection, these issues typically don’t resolve on their own. After making an appointment, be sure to stay upright and avoid lying flat. Drink plenty of fluids to prevent dehydration, which could make it more complicated. If a tooth is knocked out with the root, you will likely need a dental implant. If you are able to see a doctor within an hour, there is a chance at being able to put the tooth back in its socket. You may still need a root canal in this situation. If you still have the tooth, be sure to only hold it by the crown, or the large end of the tooth, not the root, or pointy end. If possible, you can try replacing the tooth, but carefully rinse it with water first. Gently push it back into the socket and slowly close your mouth to hold it in place. On the way to your dentist, keep the tooth as moist as possible. Depending on the severity of the break or chip, you’ll either need a filling, a crown, or a whole tooth extraction if the crown is cracked all the way through. If you are experiencing pain, this means that enough of the tooth was broken off to expose the dentin layer, which holds the nerves of the teeth. Pain should dissipate with time, as saliva insulates the tooth. When you call your Cheyenne dentist, give them as much information as possible so they can better serve you. They may go ahead and schedule a full appointment instead of a consultation if the situation can wait for treatment. If you see blood in the sink after brushing or while flossing, it could be a sign of gum disease or gingivitis. Typically, a dental cleaning and consistent brushing and flossing can prevent this condition from getting worse. The sooner you see a dentist in this case, the better. If you just had a surgical procedure and the area is still bleeding, see a dentist right away as bleeding should not continue overnight. Keep your mouth elevated as much as possible, especially while sleeping. If you notice a yellow, red, clear, or a white-colored pimple on your gums, it could be an abscess. This could be caused by an infected tooth, or a gum infection. The sooner you are seen by a dentist, the better. Leave the area alone and brush and floss as usual, trying not to pop the abscess. If you are experiencing sensitivity to hot and cold, tenderness when chewing, or pain, it could be a dead or dying tooth. This is known as a pulpal abscess, which is an infection of the tissue inside of the teeth that is dying. When left untreated, it could lead to swelling of the face and other more severe complications. X-rays and an exam will most likely be ordered to see the inside of the tooth. Whatever situation you are facing, know that you’re in good hands with the team at East Pershing Dental in Cheyenne. We can help both children and adults with various emergency needs while providing both comfort and care. We understand that these situations are scary and overwhelming, but with our experience and knowledge, you can put your trust in us. Give us a call right away for emergency dental treatment.